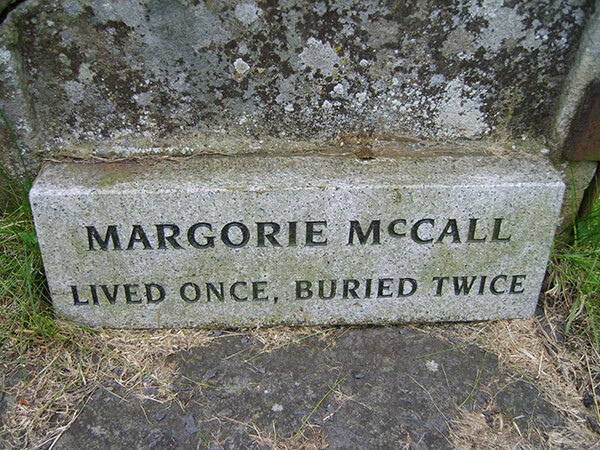 The legend of Margorie McCall - Lived once, buried twice. The legend of the “Lady with the Ring,” a woman who was accidentally buried alive, but revived when the grave diggers returned to steal her valuable jewelry. While some believe the story of Margorie McCall, the “Lady with the Ring,” is true, others believe a lack of evidence and burial records suggest the legend of the Lurgan woman who survived premature burial is mere folklore. The famous gravestone was created by stonemason William Graham and placed in Shankill Cemetery in 1860. 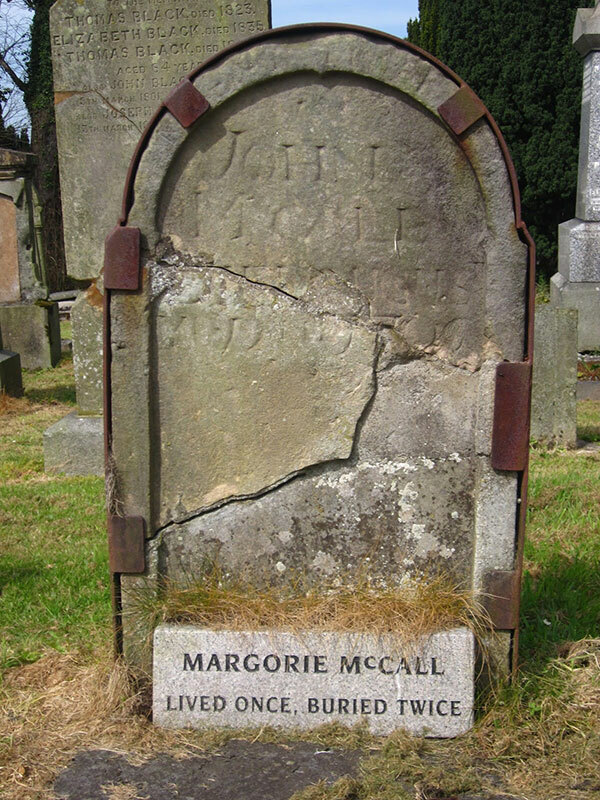 According to researchers, the church has no records of a Margorie McCall buried in 1705, nor of her being buried again later. When he opened the door to find his wife standing there, dressed in her burial clothes, blood dripping from her finger but very much alive, he dropped dead to the floor. He was buried in the plot Margorie had vacated. A story that has become part of Lurgan folklore is that of Marjorie McCall. After succumbing to a fever of some sort in 1705, Marjorie McCall was hastily buried to prevent the spread of whatever had done her in. Marjorie was buried with a valuable ring, which her husband had been unable to remove due to swelling. This made her an even better target for body snatchers, who could cash in on both the corpse and the ring. The evening after Marjorie was buried, before the soil had even settled, the grave-robbers showed up and started digging. Unable to pry the ring off the finger, they decided to cut the finger off. As soon as blood was drawn, Marjorie awoke from her coma, sat straight up and screamed. Marjorie climbed out of the hole and made her way back to her home. So is it true? Simple answer NO. It is nothing more than folklore. Marjorie is known in several towns in Germany as Richmodis von Aducht. And this was 100 years before the story arrived in Lurgan. In England she was Marjorie Ellis, Emma Edgcumbe also Annot of Benallay or Katherine Wyndham or Hannah Goodman. In Scotland she was Marjorie Elphinstone or Marjorie Halcrow or Marjorie Erskine. A renowned ethnologist determined that there were nineteen cities in Germany that claimed that a version of the Lady of the Ring. In eleven of the cases, there were sculptures that commemorated the strange ending to the story. None showed death records of the period to prove it. Much in the same way as I have searched the Shankill Parish records and found no Marjorie McCall married to a John McCall in Lurgan. So where did the headstone come from? With no record of her burial in Shankill cemetery or for that matter of her existence, it has been said a local monumental sculptor was permitted to erect the stone in Shankill cemetery in the early 19th century, some two hundred years after Marjorie was doing the double! Versions of the story have been found to exist in almost every European country, including Germany, the Netherlands, France, Scandinavia, Italy, England, Scotland, and Ireland. The story is also told about a former resident of Lunenburg, Nova Scotia, Canada. Yes the exact same story, word for word. The central feature of the story is that a woman is buried or entombed while wearing a valuable ring. Shortly after the burial, a grave robber (often a corrupt sexton) disinters the body with the intent of stealing the ring. The robber is unable to slide the ring off the woman’s finger, so he prepares to cut off the finger with a knife. However, upon making the initial incision, the woman awakes, surprising the grave robber. The woman had not been dead at all, but had been the victim of premature burial. And in every story there are a few variations. The woman’s husband or other people at her house think that she is a ghost and refuse her entry into the house. It is nothing more than an entertaining story told throughout Europe. Thank you for sharing this interesting sto?y. People were buried alive by accident a lot back then. That is where the saying “saved by the bell” comes from. People had bells tied to their fingers which they wrung if they woke up. Nope. Saved by the bell comes from boxing, where a bell is rung to signal the end of a round of fighting. If that happens while a fighter is being counted out, the count is stopped and the boxer is saved from losing – saved by the bell. Now, there was a fad for burial/coffin designs intended to allow those accidentally buried alive to signal for help. These often included bells. However, it’s not the source of the saying. The phrase “dead ringer” originates from this. Dead ringer is an idiom in English. 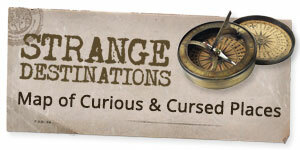 It means “an exact duplicate” and derives from 19th-century horse-racing slang for a horse presented “under a false name and pedigree”; “ringer” was a late nineteenth-century term for a duplicate, usually with implications of dishonesty, and “dead” in this case means “precise”, as in “dead centre”. The term is sometimes implausibly said to derive, like “saved by the bell”, from a custom of providing a cord in coffins for someone who has been buried alive to ring a bell to call for help.